Remis Power Systems Inc. has been an industry-leading supplier of industrial batteries and chargers since 1980. 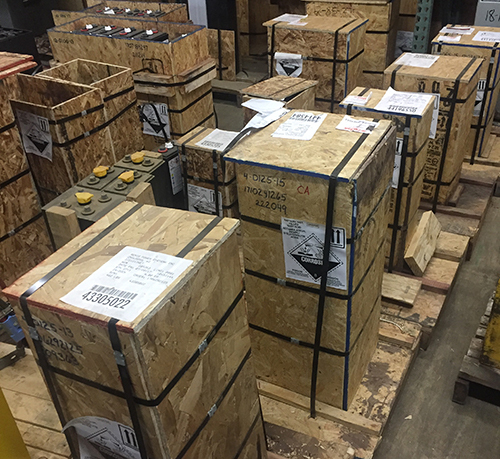 We maintain an impressive inventory of new and certified reconditioned Deka batteries for all your industrial power needs, alongside a well-trained staff of industry experts. Visit us today at any one of our three Wisconsin locations, in Onalaska, Jefferson or Kaukauna. For industrial power solutions of the highest caliber, completely tailored to the needs of your unique application, choose Remis Power Systems Inc. For decades, we’ve been the premier supplier of industrial batteries to Jefferson, WI and throughout the Midwest, bringing our customers state-of-the-art options from Deka and other industry-leading brand names. From motive power solutions, to stationary power systems, to replacement parts and accessories for batteries, we strive to be an all-in-one solution when it comes to industrial power. We can even provide battery maintenance and repair services to keep your existing products running at their highest capacity for longer. Alongside our industrial battery supply in Jefferson, WI, we’re also the foremost experts on battery technologies. Our depth of experience and ongoing engagement within the industry have allowed us to stay abreast of evolving tech—such as lithium-ion batteries and battery washing systems—in order to provide our customers with next-level service. And, when your battery reaches the end of its life, we’re even here to dispose of it for you, complete with a certificate of responsible destruction. Let us demonstrate for you, firsthand, why we’re one of the best-known names in the industrial power sector. Family-owned and -operated since 1980, we’re a respected leader within the industry and take pride in providing industry-leading products and services to our customers. We strive to be an environmentally-conscious company and practice recycling lead-acid batteries responsibly. We’re known for maintaining a huge inventory of new and reconditioned Deka batteries and offer extremely fast delivery. We offer free consultation to all of our customers, alongside fair, upfront pricing on all of our batteries and battery services. Our business is backed by a nationwide network for repairs and maintenance, giving us the resources we need to be your all-in-one solution for battery services. When you need new industrial power solutions or battery services from qualified professionals, look to Remis Power Systems Inc. We’re ready to deliver the products and services you need.